Week 8 of my Eating Around the World adventure took us to Ukraine. Ukrainian food I found to be what I consider peasant food, now this is not an insult, by peasant food I mean, you take cheap, simple ingredients and you turn it into a delicious meal. 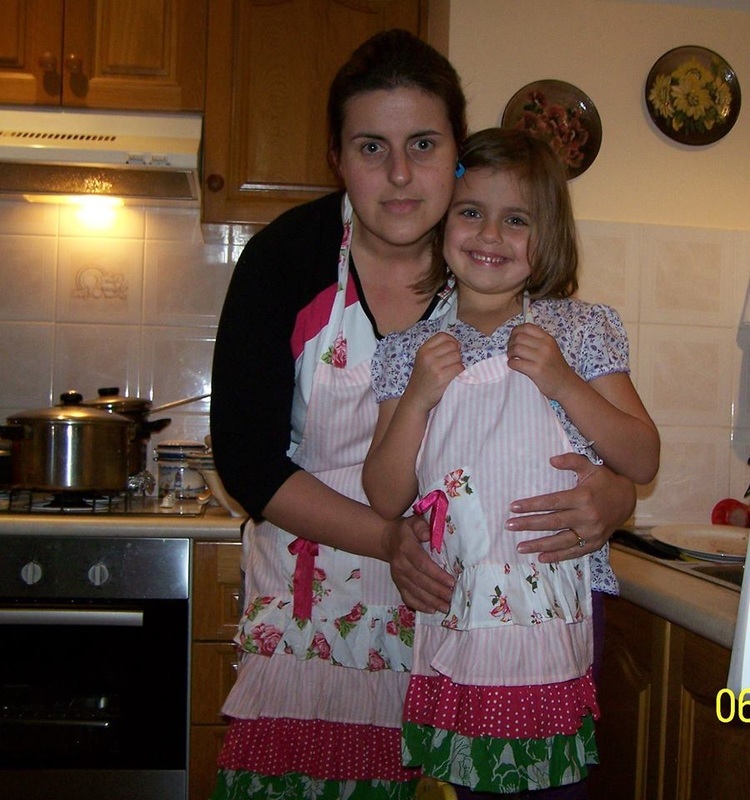 Everything is from scratch and you make everything from the dough to the fillings for example. The food was village food, which I love, food that you will find in homes not restaurants. 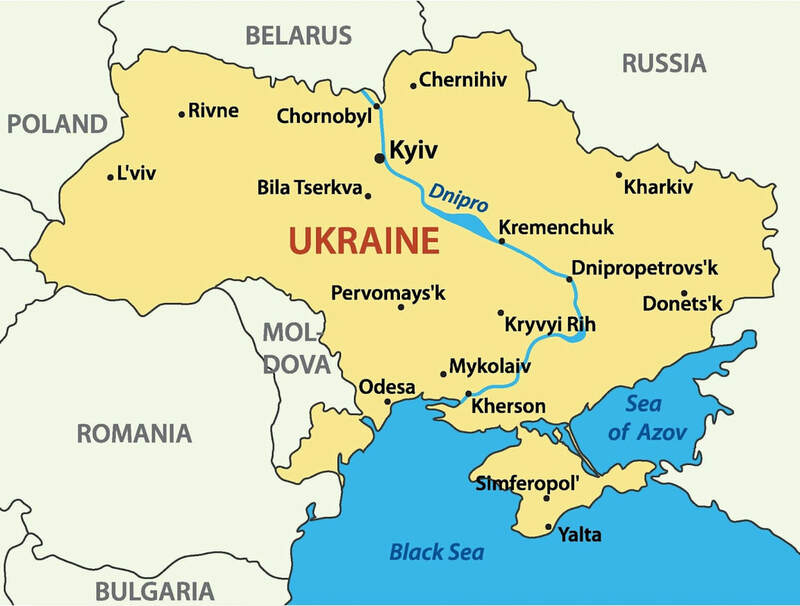 We really enjoyed the Ukraine, we tried many new foods that will now become a part of our food history. The dough for the Vareniki for instance was amazing. The Chocolate Babka truly delicious, we got to try and love Chicken kiev for the first time. This journey allows us to try things we would otherwise never have experienced. So here is what I cooked on our little adventure into Ukraine, hope you try some of these to. 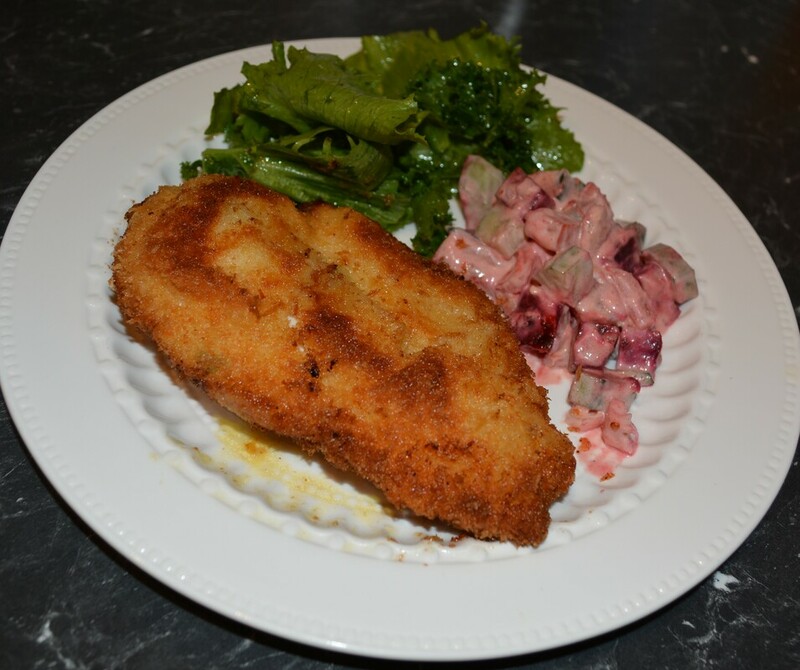 Chicken Kiev: This classic dish was delicious, I mean who doesn't love a schnitzel, and what could make a humble schnitzel even better, add some flavoured butter in the middle. This was crisp, this was juicy, this was a great dish. 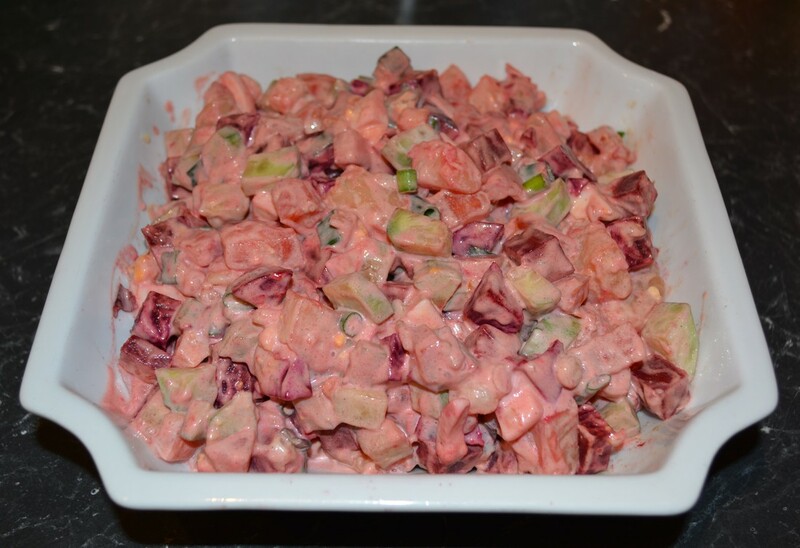 Ukrainian Potato and Beetroot Salad: Now this I made to go with the chicken kiev. Now I cannot remember where this recipe came from, but based on the photo I boiled red and golden beetroot until tender. I boiled potatoes, until tender. I hard boiled some eggs. Now I cut everything into similar sized pieces. I also used fresh cucumber instead of pickled, which I loved, I added spring onions, then mixed everything with some mayonnaise and seasoned it with salt and pepper. I have no idea regarding the quantities, but I will make this again and get a proper recipe up then. 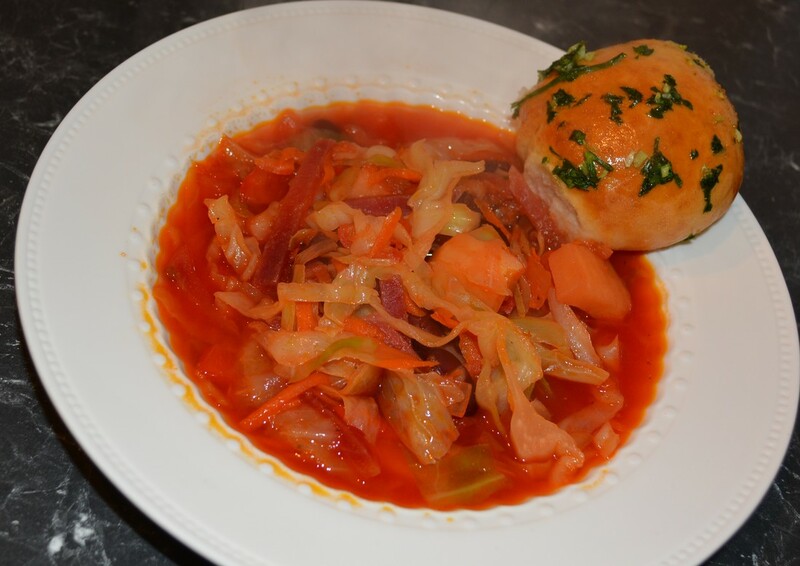 Borshch: Ukainian Beetroot Broth: Soups are always well received in my house, my husband and kids love them. This one was really good we quite enjoyed it. 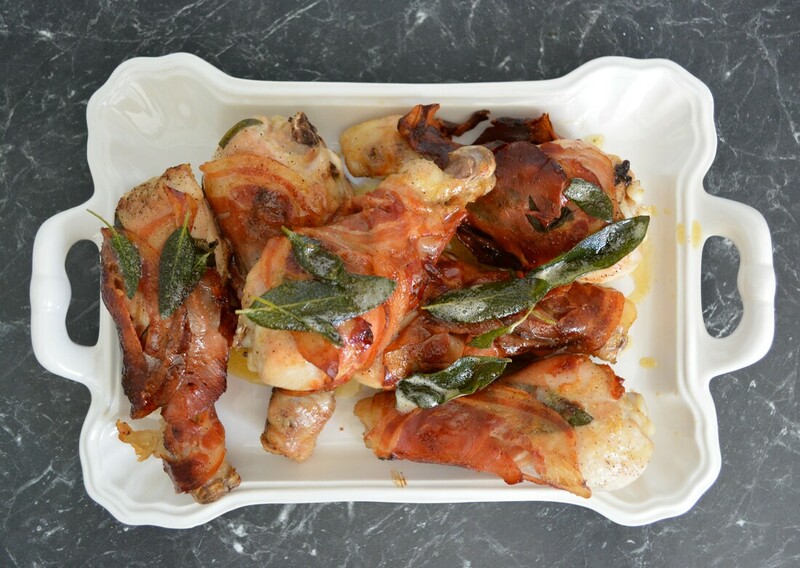 You can use whole chicken instead of beef, both versions are delicious. The recipe says to serve it with Ukrainian Garlic Bread-Pampushky, so I did, it really was a lovely dinner. To make the stock, simply place the meat, whole onion, bay leaf and measurement of water in a large saucepan. Season the water lightly and cook over a low heat for 1 hour. Skim off the scum with a spoon from time to time. Add the beetroot and potatoes to the stock, season well with salt and pepper and cook over low heat for 30 minutes. Meanwhile, heat the sunflower oil in a frying pan. Add the onion and carrot and cook over a medium heat, stirring, for about 5–7 minutes until the carrot is soft and is about to start caramelising. 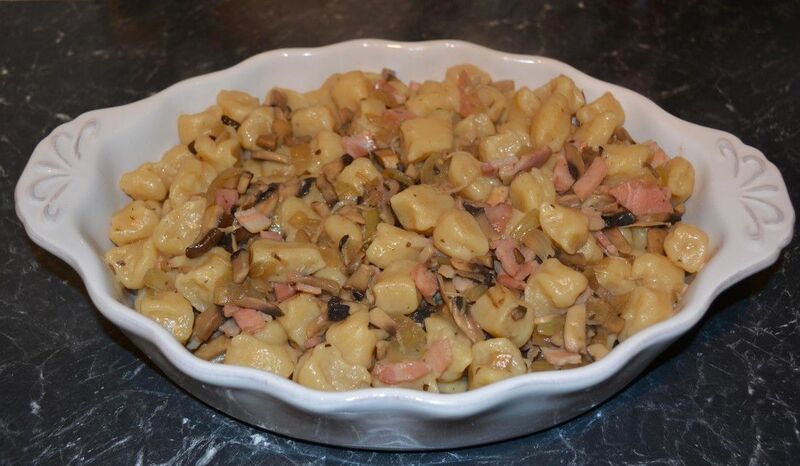 This is a distinctively Ukrainian soffritto technique called smazhennya or zazharka. Add the red capsicum and tomato paste to the onion and carrot and cook it out for 2 minutes, then add the grated fresh tomato, stir and reduce slightly before adding all of this to the broth. Finally, add the shredded cabbage and beans to the broth and cook for about 7 minutes until cooked through. Serve with a dollop of soured cream, chopped dill and pampushky. 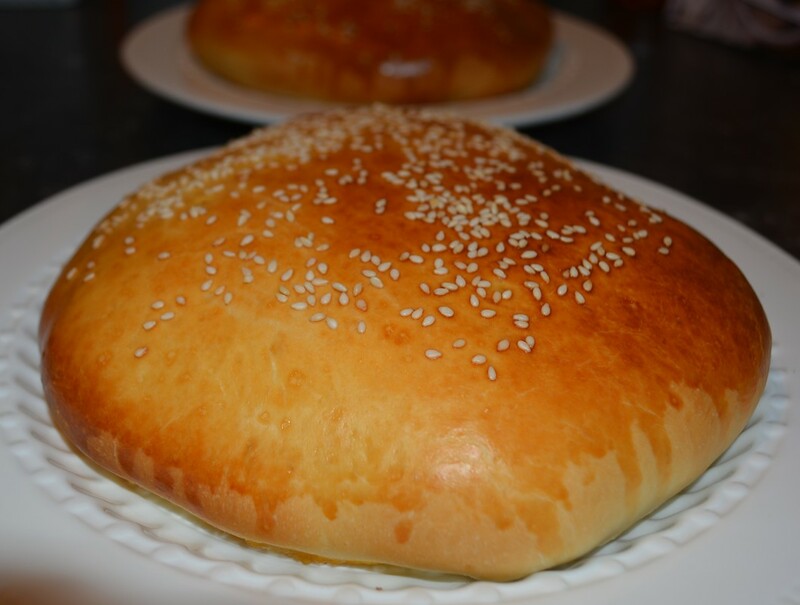 Pampushky Ukrainian Garlic Bread: Now my daughter loves bread, she also really loves garlic bread, so I had to make these to accompany the borshch. We loved these and by adding the bread, the soup really is a complete meal, you don't need anything else. First make a ‘sponge’, which is a type of yeasty starter. Dissolve the yeast and sugar in the measurement water (make sure it’s blood temperature – hot water would kill the yeast!). Add 200g (7oz) of the flour and mix roughly. Cover with clingfilm and leave to prove in the refrigerator overnight. The next morning, add the rest of the flour and fine sea salt to the starter and knead on a well-floured work surface until the dough is smooth and comes away from your hands easily. 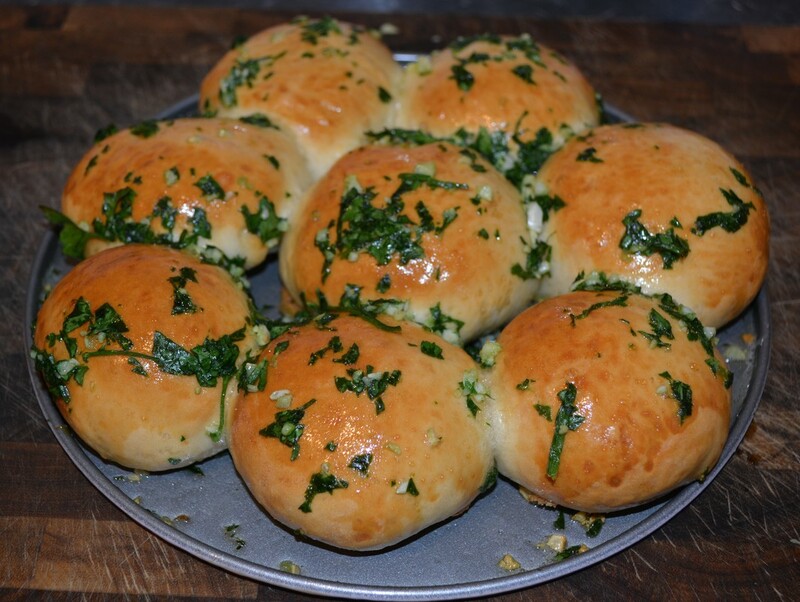 Divide the dough into 8 pieces and shape into round buns. Put them side by side in an oiled round ovenproof dish or a 24cm round cake tin, cover and let them prove again, this time in a warm place, until doubled in size. They will join together just like hot cross buns do. Meanwhile, preheat the oven to 220C/200C fan forced. To make the basting oil, simply stir the crushed garlic through the oil with a small pinch of sea salt and the parsley, then let it infuse. When the pampushky look plump and ready, brush them generously with some beaten egg to glaze and bake for 20–25 minutes or until they form a glistening golden crust. Take them out and baste them with the garlic oil. Serve immediately. 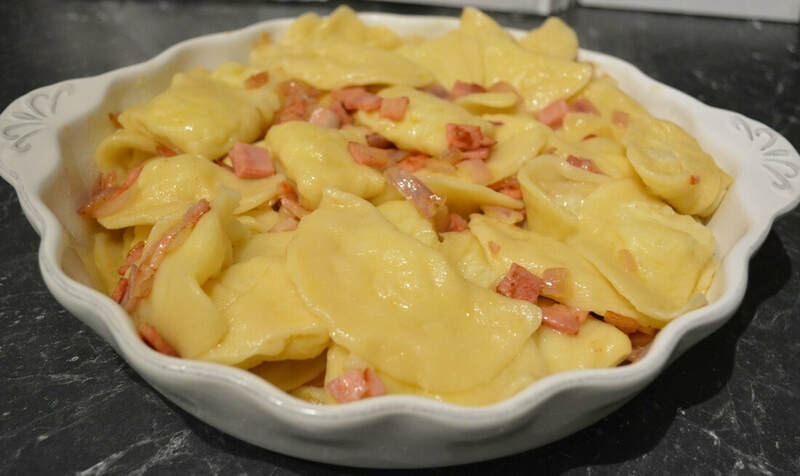 Galushki Ukrainian Dumplings: We love gnocchi so when I found the Ukrainian version I thought I would try it. They are made out of a dough though, not potatoes, like gnocchi are. I found them a little tough, but my kids liked it. My daughter who loves anything made from dough, enjoyed it. Would I make it again no, but what I will make again is the bacon sauce, it was delicious with the galushki. 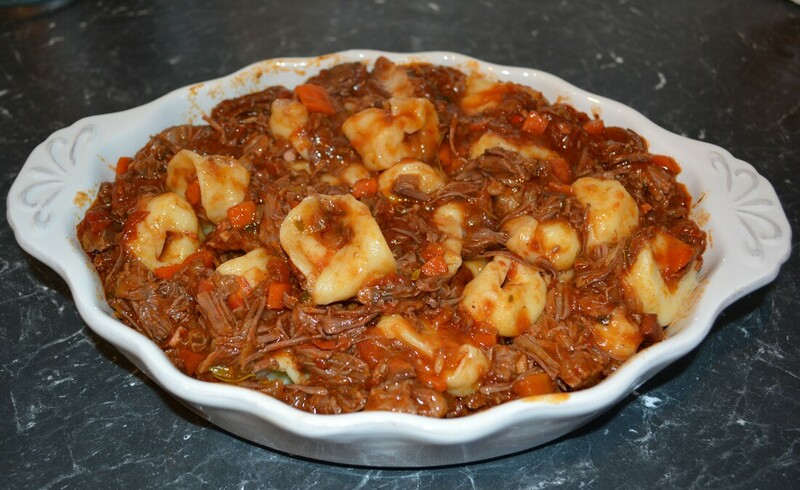 The sauce would go so well, as a quick sauce with gnocchi for instance, simple but satisfying. 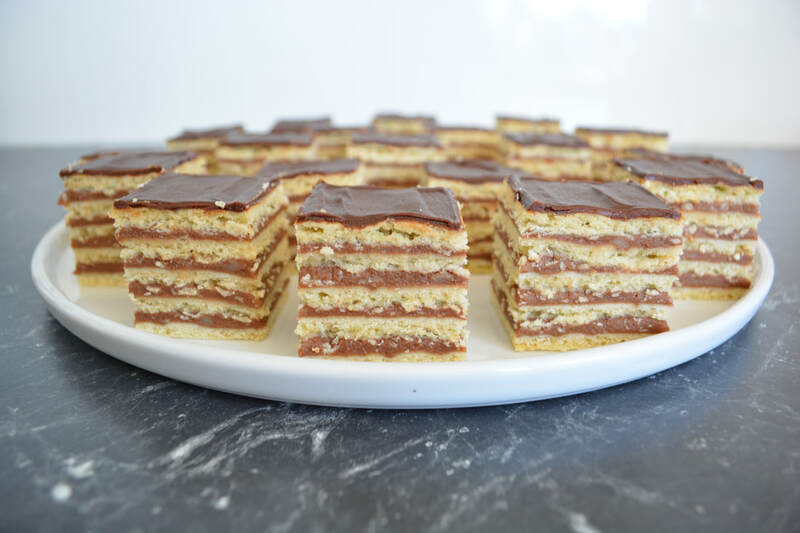 I've shared the link to the original recipe for you to see how these are made. Cheese Galushki: After making the plain Galushki which I though were a little tough but okay, I thought I'd try a cheese version. I found the end result the same, they were okay, we ate it, but did I love it, no. It was great to try, but the recipe won't be repeated. I also served it with the mushroom and bacon sauce I made originally. In the Ukraine they would fry the galushki after boiling them and just serve it with sour cream. Now I like sour cream, but to serve it as a sauce just doesn't work for me. Again I've shared the link for you, in case you want to see how they are made. 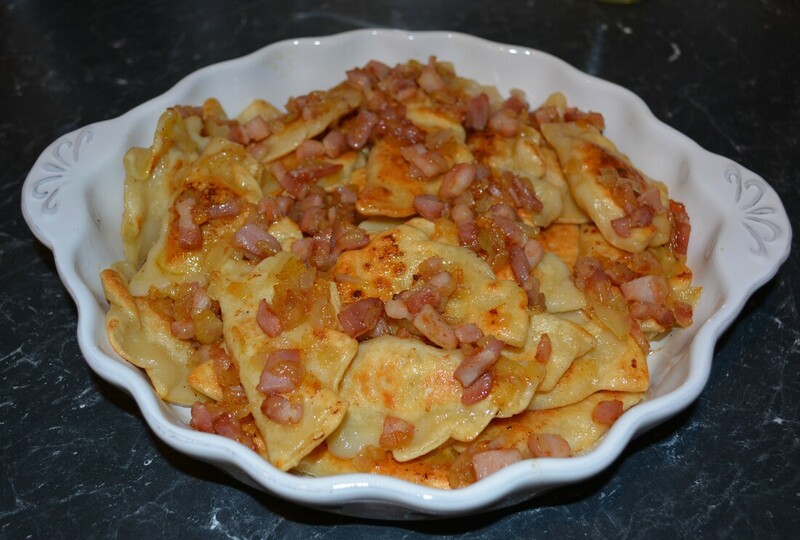 Potato and Caramelised Onion Vareniki: Vareniki is stuffed Ukranian pasta. After trying these a few times I have finally made them how we love them. If you like dumplings, pierogi, vareniki, try these, they do take a little time, there is a bit of work involved, but my goodness they were good. 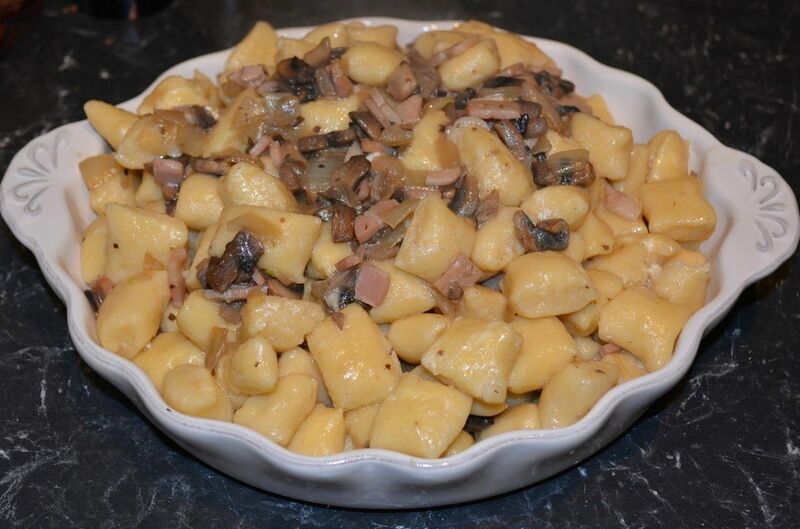 Vareniki Fried or Unfried with a Bacon, Butter and Onion Sauce. I preferred them fried, but loved them unfried also. 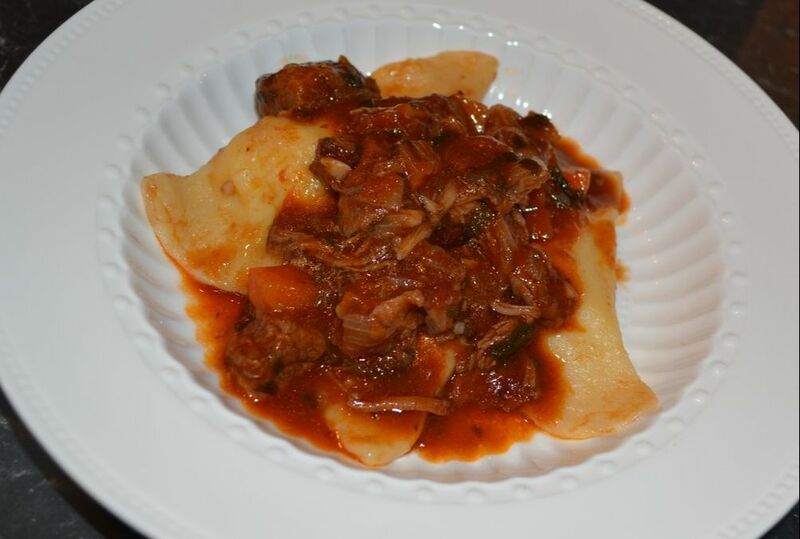 Vareniki with a meat sauce: Here I did not fry the vareniki but decided to serve it shaped like tortellini with a Short Rib Ragu. 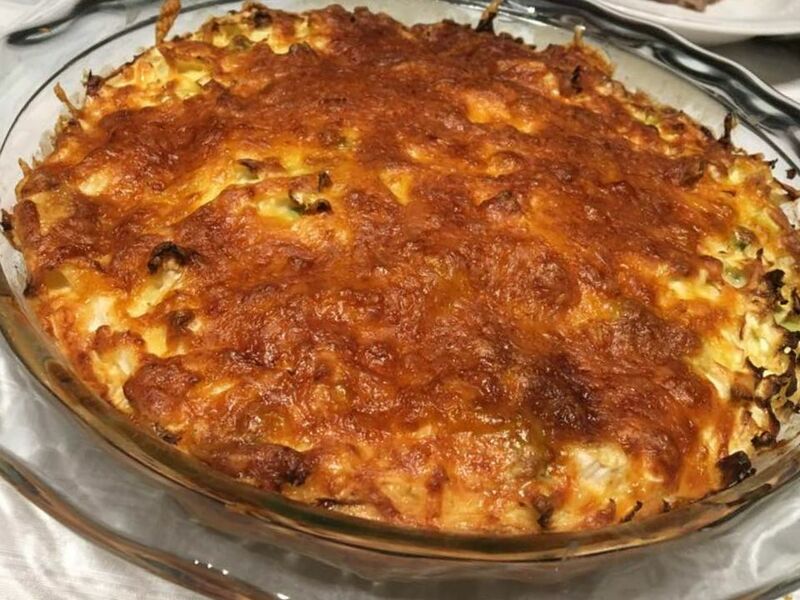 Cabbage Casserole Recipe: Here is a dish that I really liked. I do love cabbage and I do love quiche and this kind of combined the two. 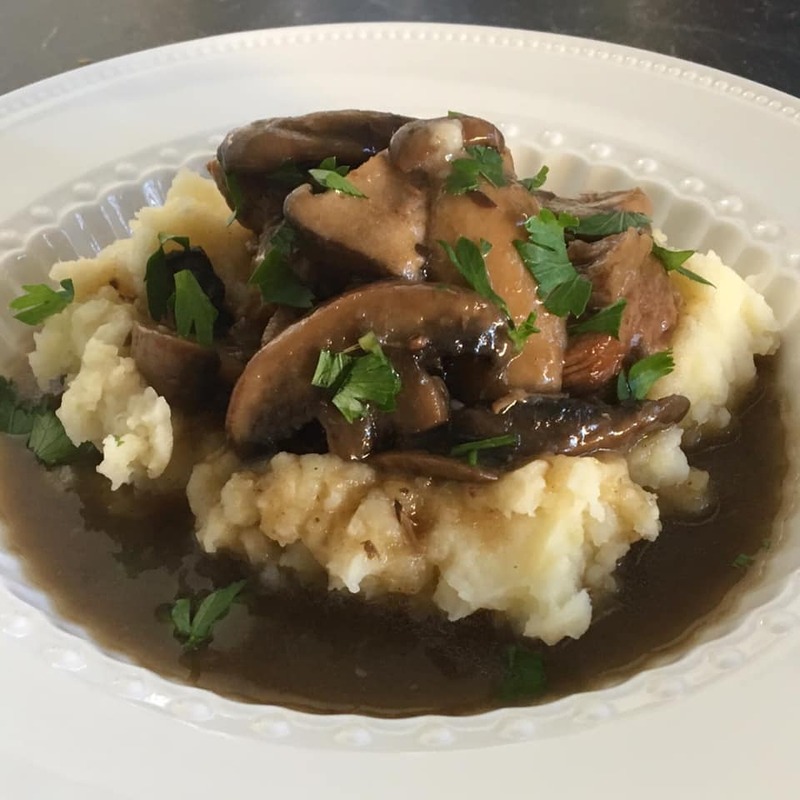 Now this is not the greatest thing I have ever eaten, but I would definitely make this again, especially on days when you are looking through your fridge and pantry and you have all the ingredients ready to go, as quite often I have these ingredients readily available. Preheat oven to 190C/170C fan forced and butter a 22cm round pie dish. In a medium mixing bowl, add eggs, sour cream and mayonnaise and whisk until blended. In a small mixing bowl, stir together the flour, baking powder and cornflour. Whisk flour mixture into batter until smooth. Place thinly sliced cabbage into second medium mixing bowl and sprinkle with salt. Scrunch cabbage for 30 seconds to soften then stir in green onion and dill. Spread cabbage mixture over bottom of greased pie dish and pour batter evenly over the top. Sprinkle top with shredded mozzarella and bake on the center rack for about 35 min or until top is golden. Chicken and Cabbage Savoury Pirog: Now I really liked this, as did my family. A pirog is a baked dough with a sweet or savory filling. They come in a variety of shapes and sizes. This recipe has a nice soft dough with a savory chicken, cabbage and vegetable filling. It won't be the greatest thing you have ever eaten, but it is really nice when you feel like some dough, but you don't feel like pizza, it's like a pizza sandwich with a really nice savoury filling. This is one of those meals you make when you need to clean out the fridge a bit. Prepare dough: In a bowl, whisk mayonnaise, oil, salt, water and milk. Sprinkle yeast over top of the mixture and sprinkle sugar over yeast. Cover bowl with a kitchen towel, let sit 5 minutes for the yeast to activate and become foamy. Gradually add flour, mix until flour is well incorporated. Set dough aside to rise at room temperature, covered, 1 ½ to 2 hours (until the dough doubles, almost triples in size). Prepare filling: In a large frying pan, over med/high heat, cook chicken in 1 teaspoon of oil until fully cooked (about 2-3 minutes), stirring as needed. Remove from the pan. Sauté onion in 1 tablespoon butter until tender, stirring frequently. Add 2 tablespoons butter, cabbage, carrots, garlic and water. Season with salt and pepper. Sauté until cabbage is desired tenderness. Add the ketchup, sour cream, herbs and the chicken that was set aside. Cook another minute, stirring frequently. Remove from heat to cool. Assemble the pirog: On a lightly floured surface, divide dough into 2 equal parts (cover second dough). Roll out until about 30cm round. Take half of the cabbage filling and place it into the center of the dough, spread evenly (leaving about 7cm of dough uncovered around the edges). Gently start pulling the edges of the dough over the filling into the center to close the pirog. Continue going around until cabbage is completely covered. Pinch seams together. Gently, flip the pirog over. Flatten the pirog as needed so it’s even in size and so the filling is evenly distributed. Repeat with second pirog. Brush with egg wash, sprinkle with sesame seeds and let rise 30-45 minutes. Bake in a preheated oven to 205C/185C fan forced for 18-22 minutes, until golden in color. Chocolate Babka: This is probably my greatest find on this journey to the Ukraine. 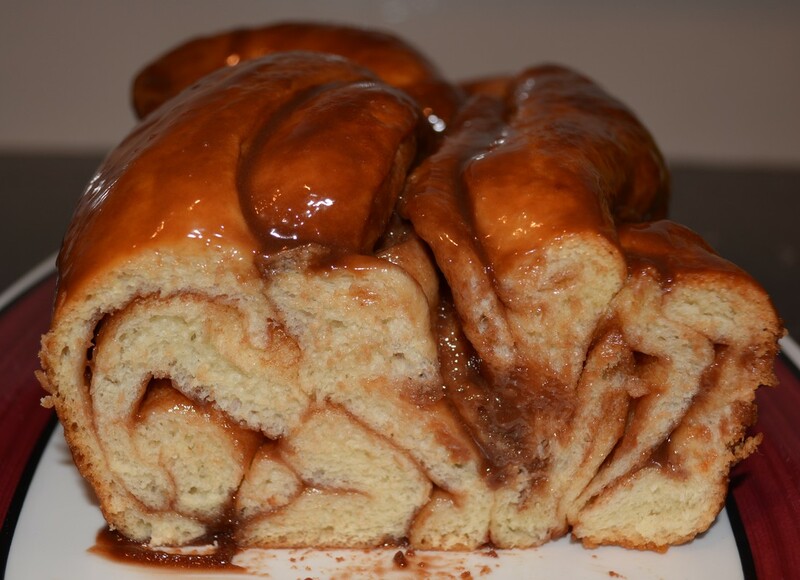 This is the chocolate version of a cinnamon bun. The dough is so soft, it's perfect. 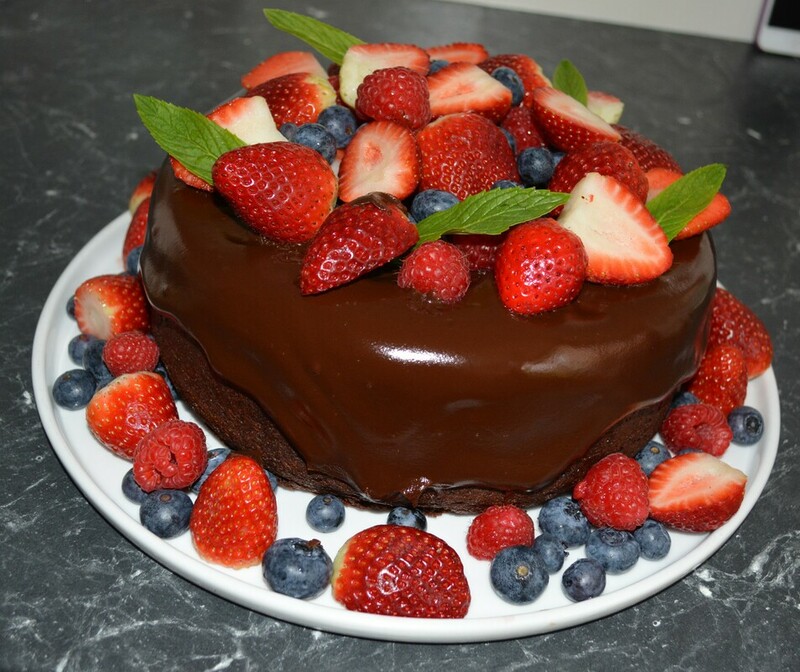 The ganache is delicious. Make this on a lazy Sunday as you do need time to allow the dough to rise, but it is well worth the time. Braided Easter Bread: Although the chocolate version above is better and I would make it more often, I really enjoyed this version also. I love the surprise inside this Easter Bread, it reminds me of a danish. 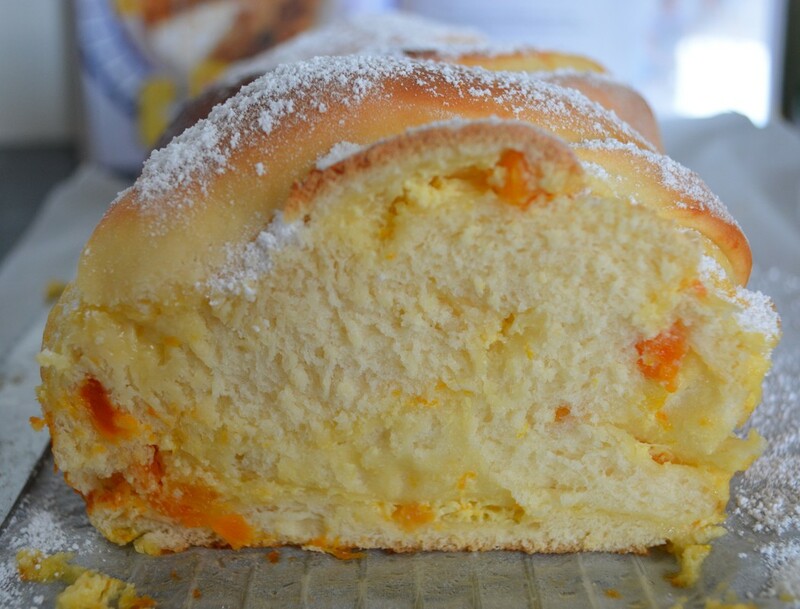 The lovely bites of apricot and the ribbons of cheese give it a tang that I loved. I think this is something I will make every year for Easter myself from now on, it will become an Easter tradition for me and my family. If you can't find farmers cheese, I use quark, an easy google search will lead you to other farmers cheese alternatives. In a measuring cup, combine warm milk (not hot), 1 teaspoon sugar and yeast. Stir to combine and let sit 10 minutes to proof. In a small bowl, add egg, remaining 3 tablespoons sugar, salt and whisk together. Whisk in warm melted butter (NOT HOT). Lastly whisk in proofed yeast mixture. In a large mixing bowl, add the flour then add wet ingredients. Combine dough with a spatula then knead by hand 10 minutes, you can use a mixer with hook attachment. Dough will be soft and not sticking to your hands. Form dough into a ball then cover bowl with plastic wrap, and let rise at room temperature 1 1/2 to 2 hours, until doubled in size. Meanwhile, make cheese filling: In a medium bowl crumble farmers cheese with a fork. Add sugar and egg yolk. Use spatula to blend until combined and somewhat creamy. Add diced apricots and orange zest. Once dough has risen, punch it down and transfer to lightly floured surface. Roll dough into 30cm x 22cm rectangle, between 0.3cm and 0.6 thick. Add cheese filling and spread evenly leaving a 1cm border at the edges. Roll dough into a log starting from the long end and pinch edges to seal. Cut the roll in half to split into 2 strands, keeping them attached at one end. Overlap the 2 strands starting at the connected end and weaving them together towards the ends. Pinch the ends to seal. Carefully transfer braid cut-side up to a greased loaf pan. 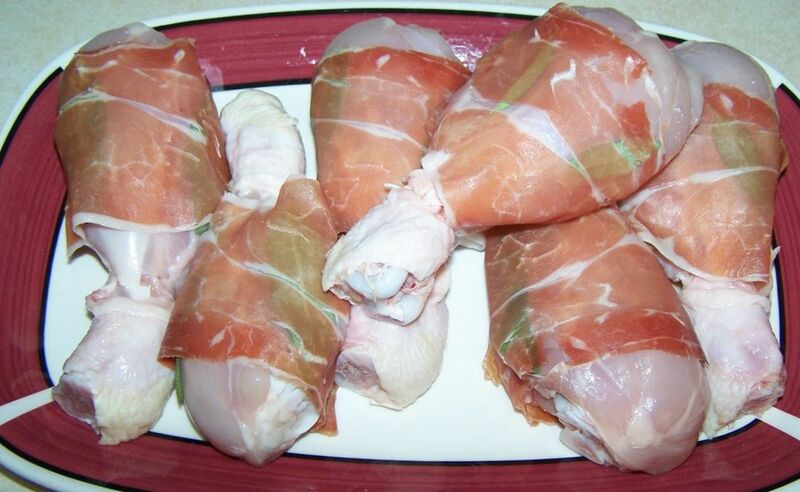 Cover with plastic wrap and let rise/puff up at room temperature 30-45 min. Beat 1 egg with 1 teaspoon water and generously brush egg wash over risen loaf. Bake in center of oven at 175C/155C fan forced for 35 to 40 minutes, or until a toothpick comes out clean. Let rest 5 minutes in pan then transfer to wire rack. Dust warm bread with powdered sugar. Once cooled to room temperature, slice and serve. 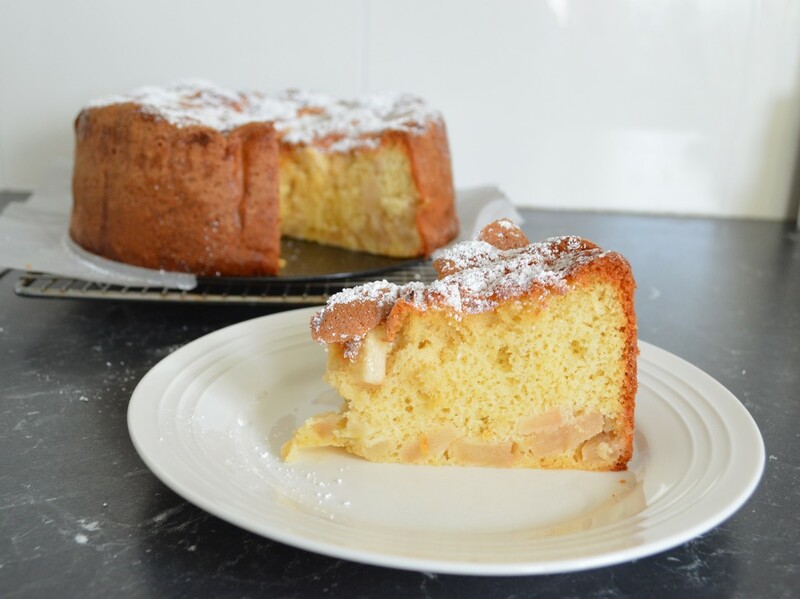 Apple Sharlotka: This cake, I did not like much, it was eggy, which means with every bite I could taste egg, not pleasant. I'm sure there is many great recipes out there that are lovely, but this was not it. 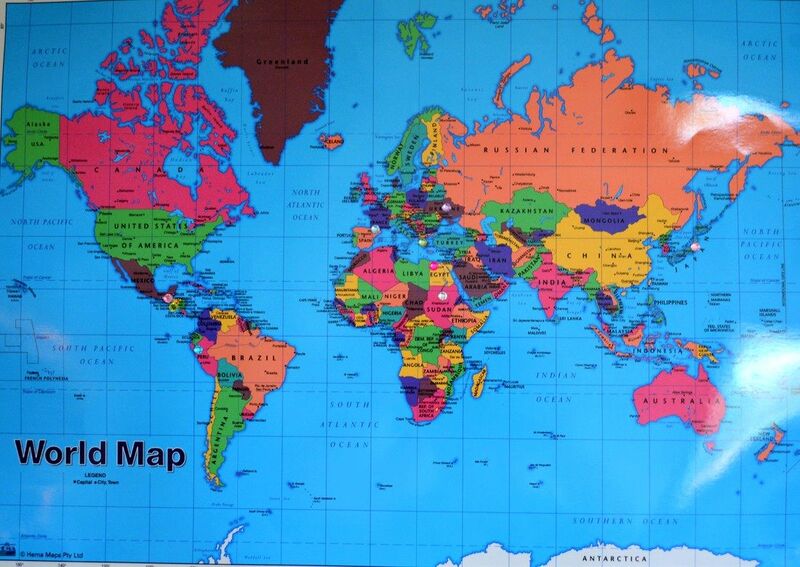 ​​​​Now to add another sticker to my world map. 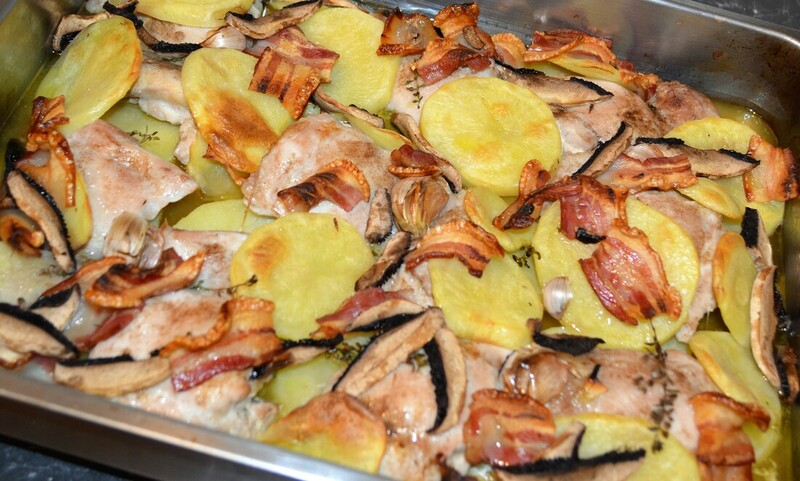 With Easter only a few days away, here is some food ideas you could serve for Easter lunch. This is just food I really love to eat and serve family and friends. Tomato and Basil Bruschetta: One of my favourite things to eat. Simple, fresh and tasty. 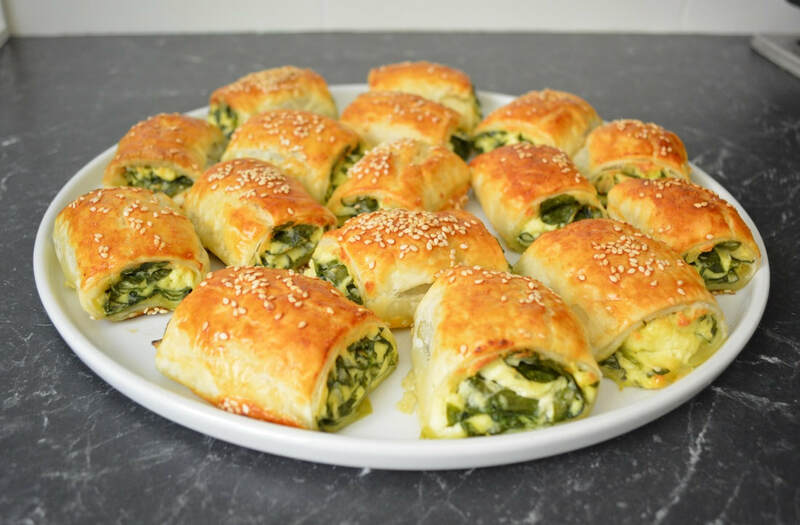 Spinach and Ricotta Rolls: I love these, they can be made in advance and frozen until needed. 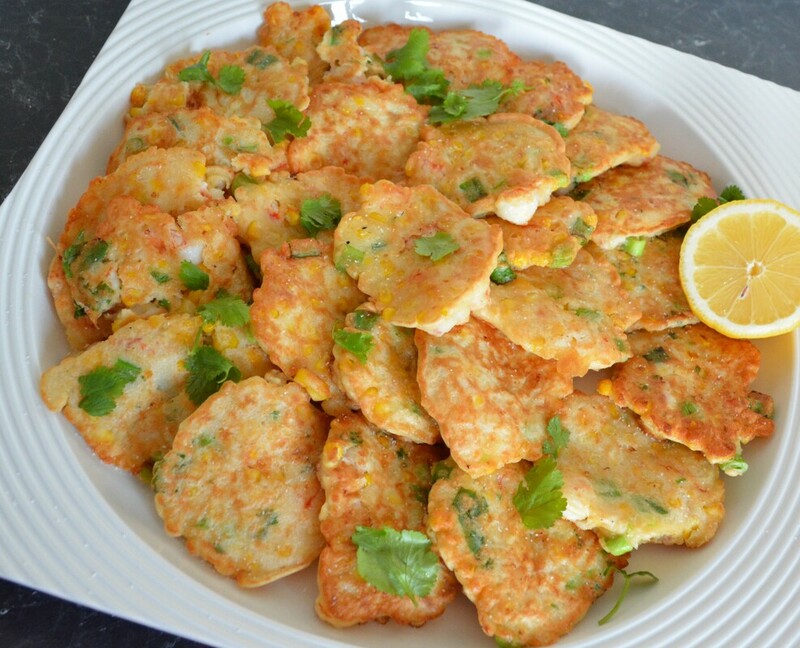 Prawn and Corn Cakes: I have yet to meet a person who doesn't love these. One of my favourite things to serve and eat. 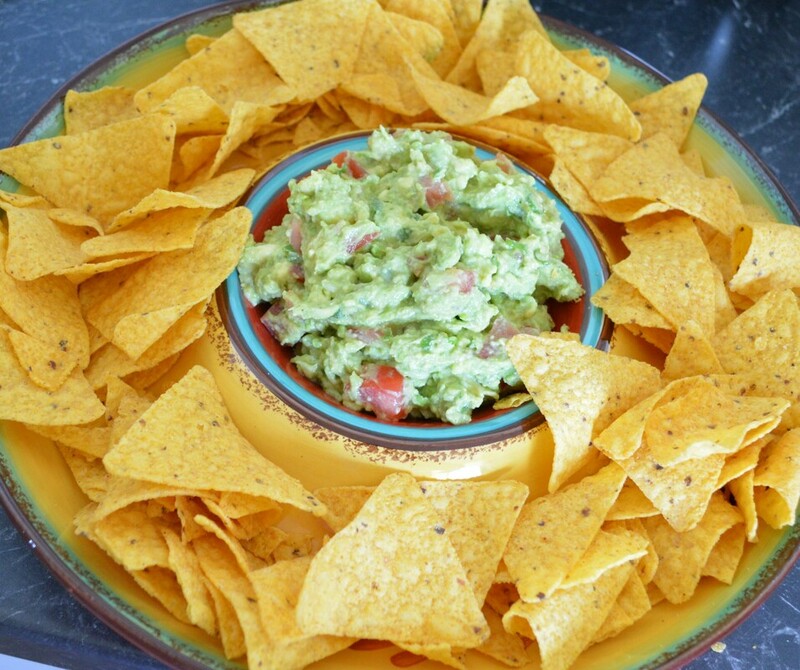 Guacamole: Could eat this every day. 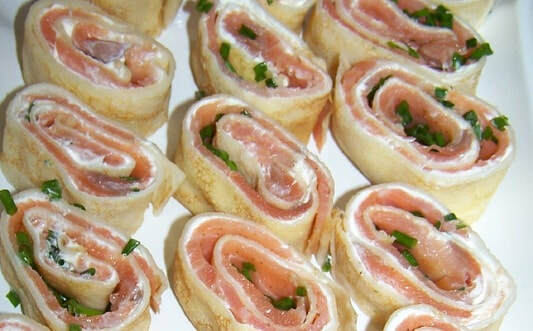 Smoked Salmon Pancake Rolls: I have been making these for years, and they are always well received by guests. 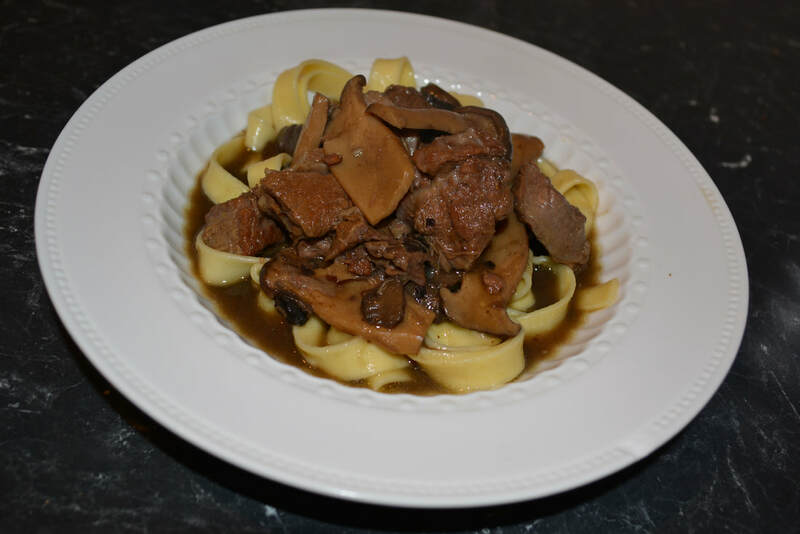 Tagliata for Two: a simple recipe that is easily doubled. Recently my husband cooked the steaks on the barbecue instead of pan-frying them which made it easier for me, all I had to do was make the marinade. 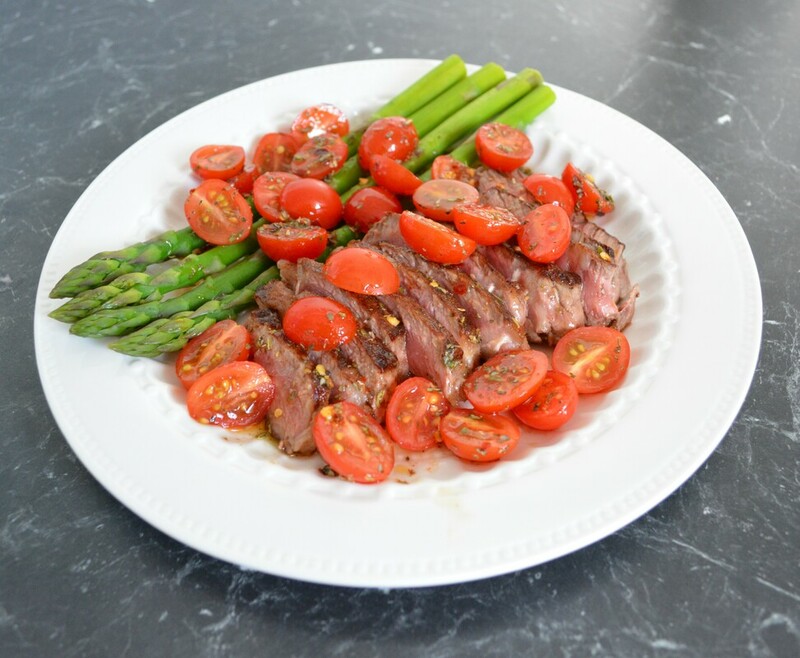 For a party, I would scatter the sliced steak on a platter, then drizzle over the dressing and scatter over the tomatoes. 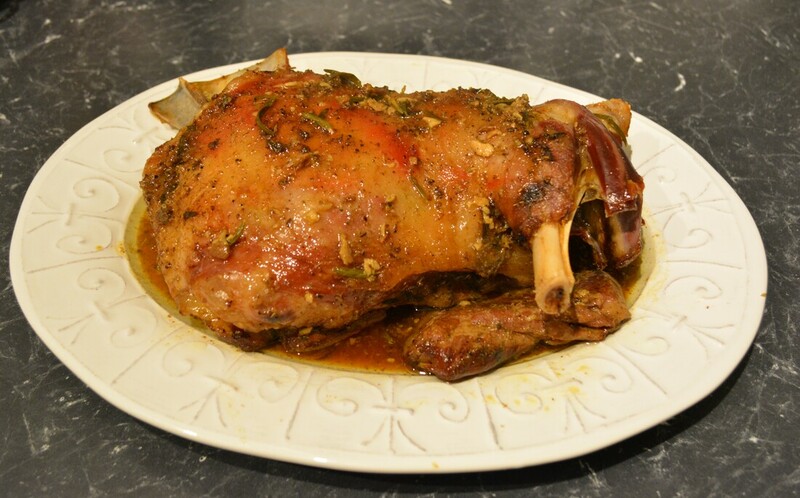 Slow Cooked Lamb Shoulder: Probably my favourite roast lamb recipe. It is so easy to make and I love it served with some Tzatziki, a Greek Salad, and an Eggplant Relish. 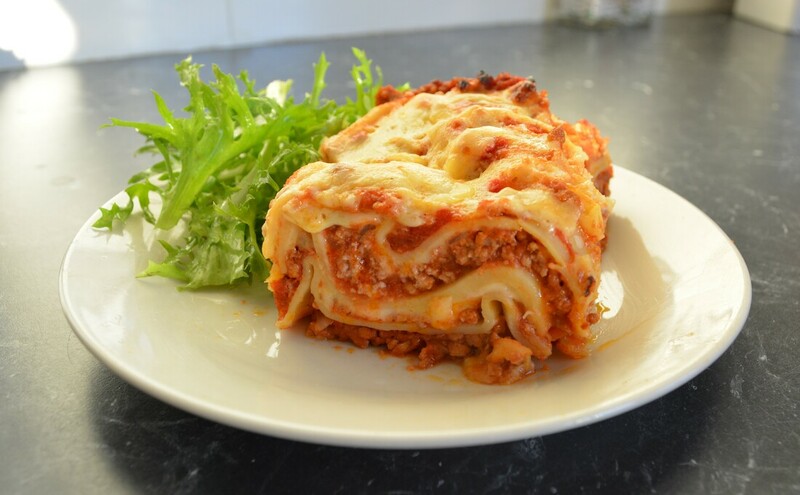 Lasagne: the ultimate party dish. It feeds many and you can make it weeks in advance and freeze it. Then defrost and cook when needed. 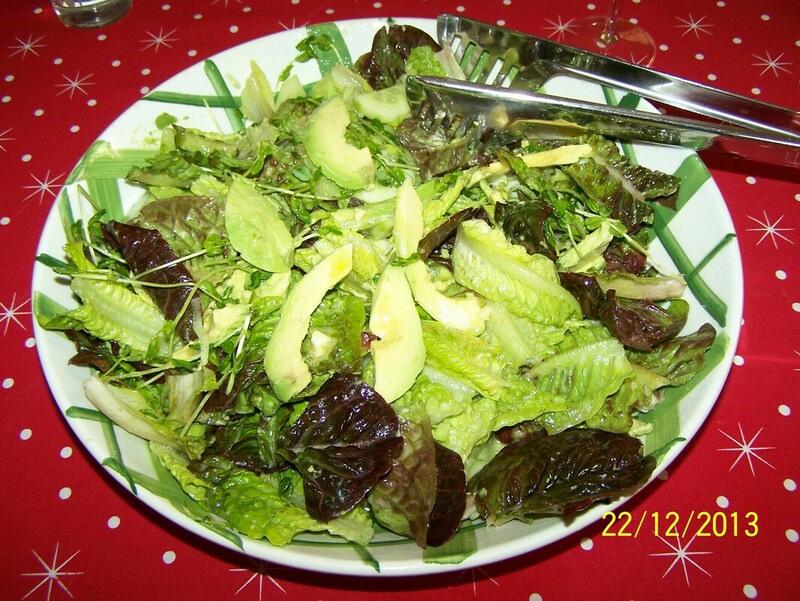 Green Salad: We love a green salad in our house. Serve this at your next barbecue, it's delicious. 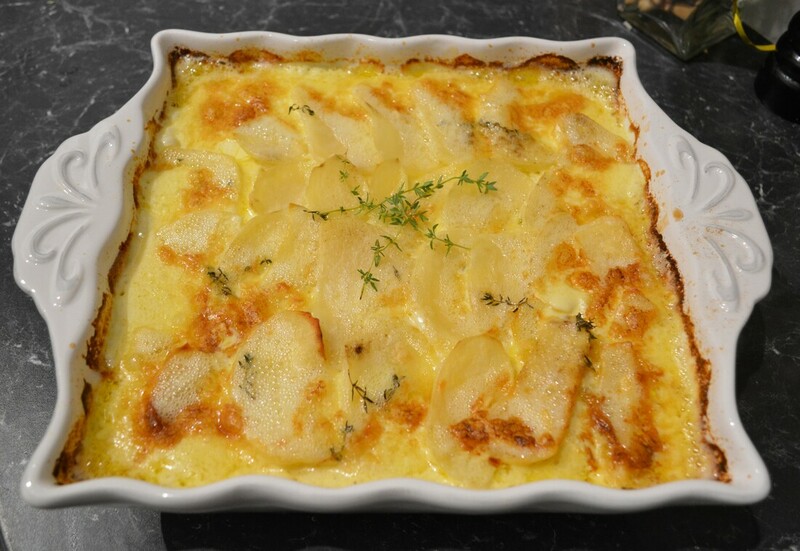 Potato Gratin: Always a crowd pleaser, I love that you can assemble it earlier, then bake it when needed. 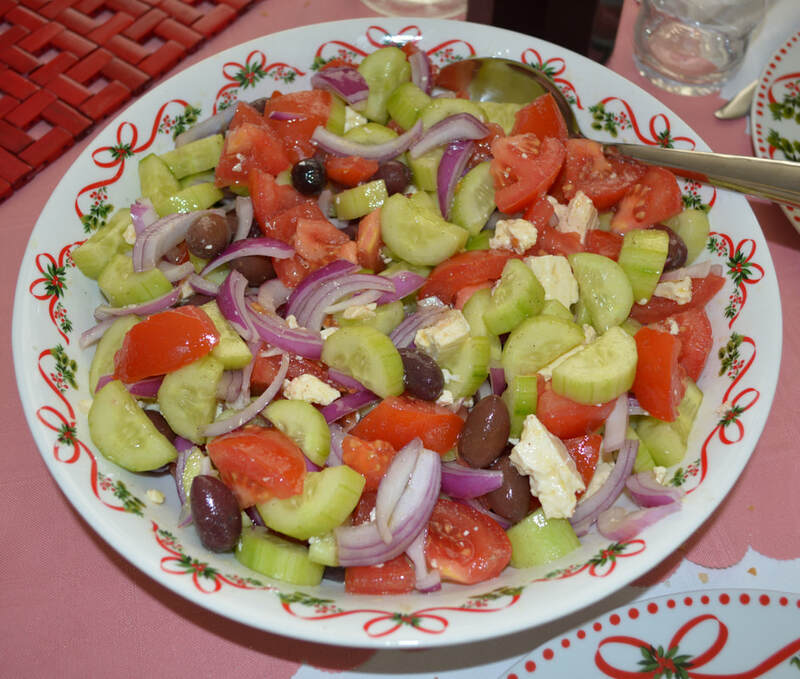 Greek Salad: Simple and goes with so many things. 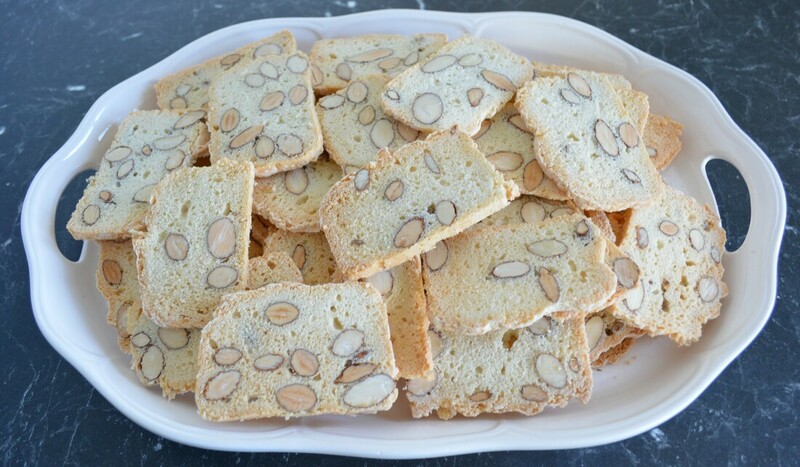 Almond Bread: my favourite biscuit, just try stopping at one. 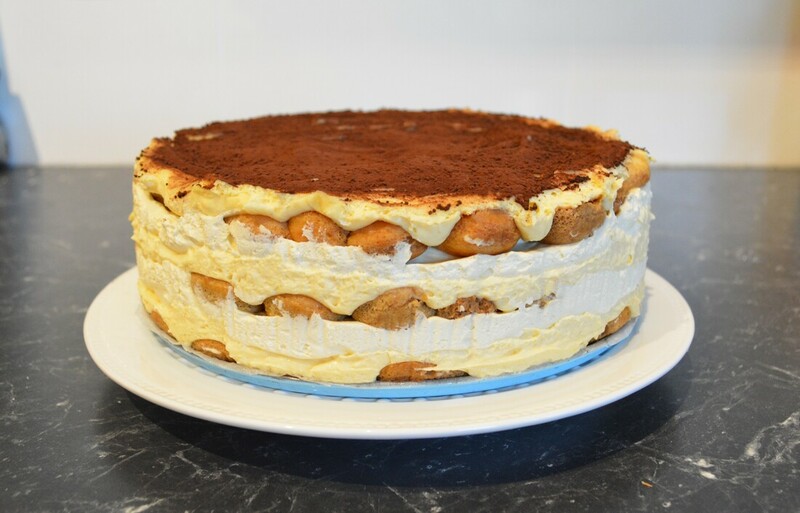 Tiramisu Torte: Here is something a little bit fancy. Great as you make it the day before. 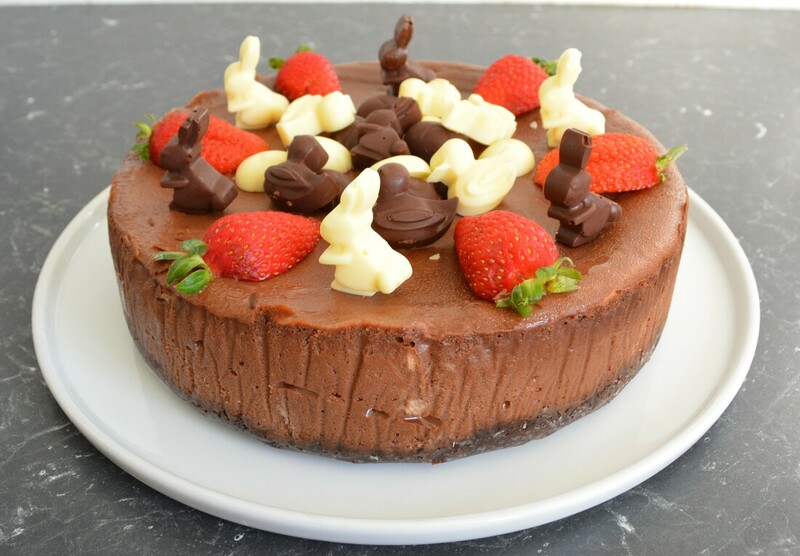 Chocolate Cheesecake: I love chocolate and I love a good cheesecake. 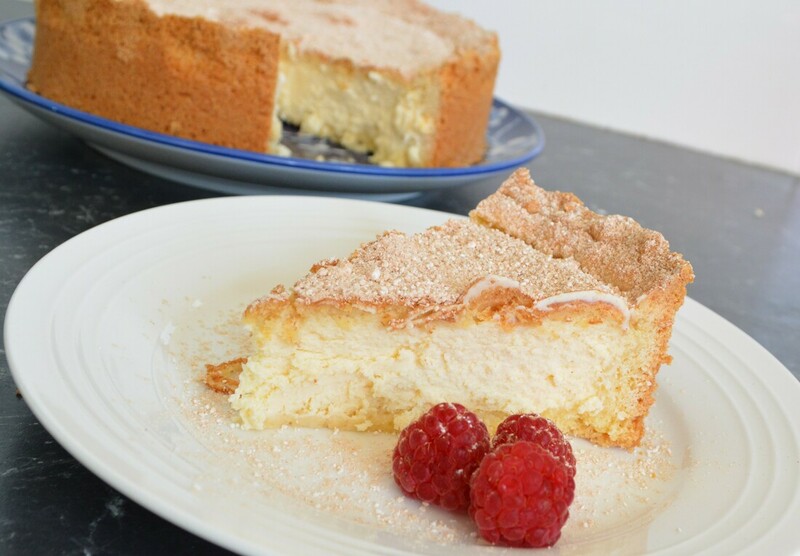 Baked Ricotta Cheesecake: My all time favourite cheesecake. I love this. 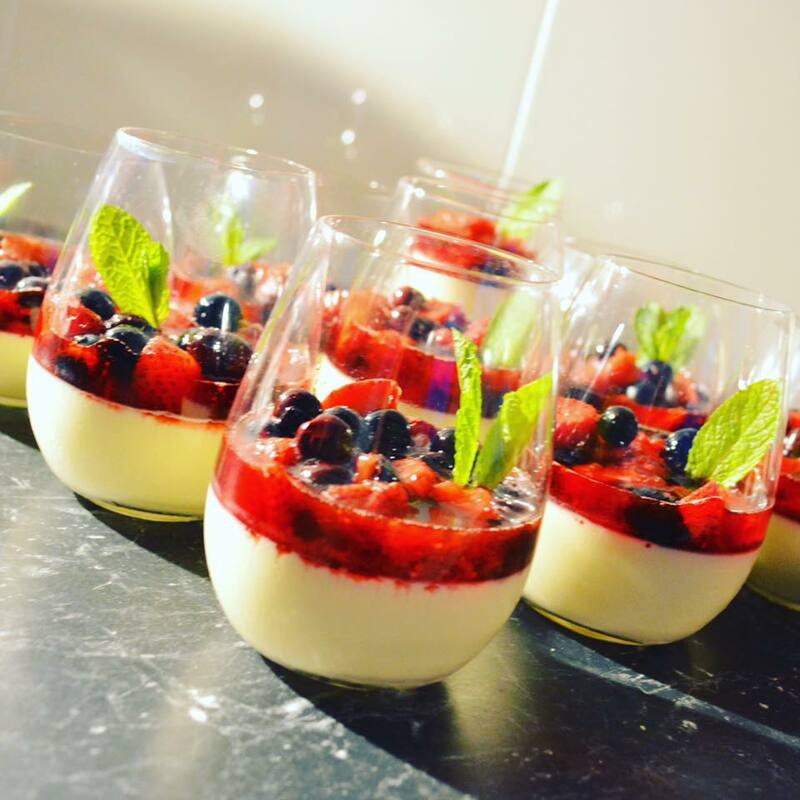 Vanilla Pannacotta with a Berry Compote: The easiest dessert you will ever make. 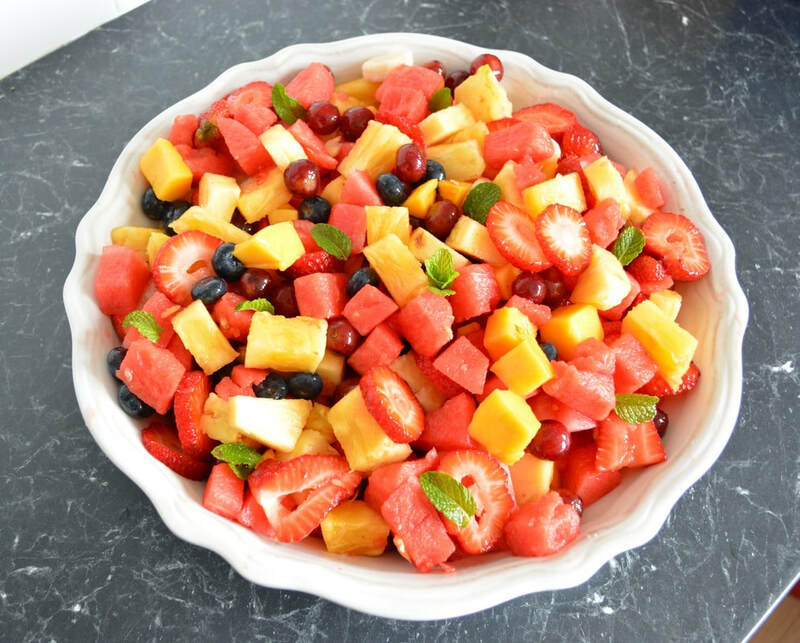 Fresh Fruit Salad with a Vanilla Lime Syrup: Simple, fresh and tasty. Chocolate Mud Cake: It's Easter, you have to indulge in chocolate. Madarica: This is amazing. It takes a bit of work to make, but you need to do it at least 4 days in advance. So great for parties. Freezes well to. 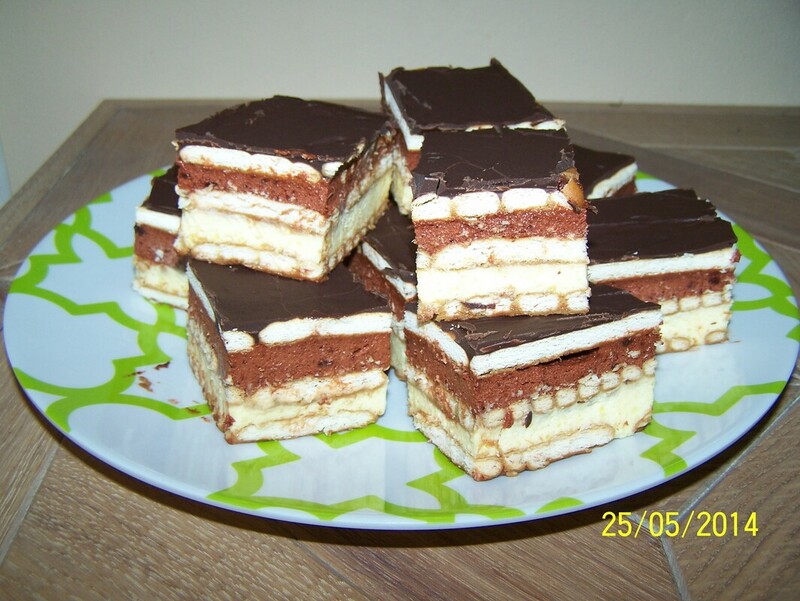 Choc Vanilla Slice: The easiest slice you could ever make. 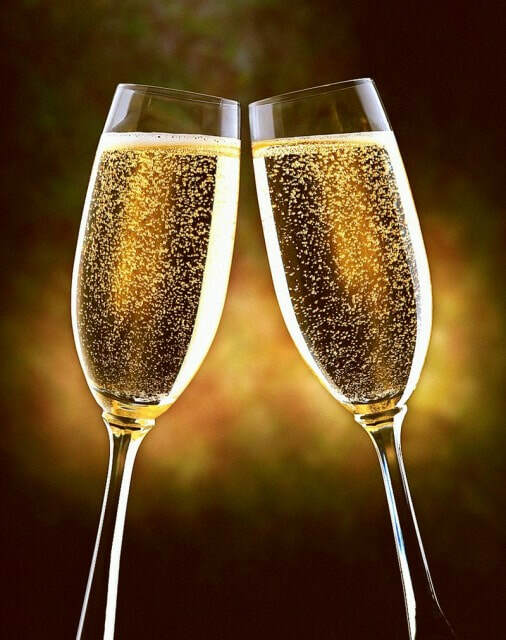 Sparkling Wine: At any party I have, there has to be spaarkling wine. Prosecco is a favourite. 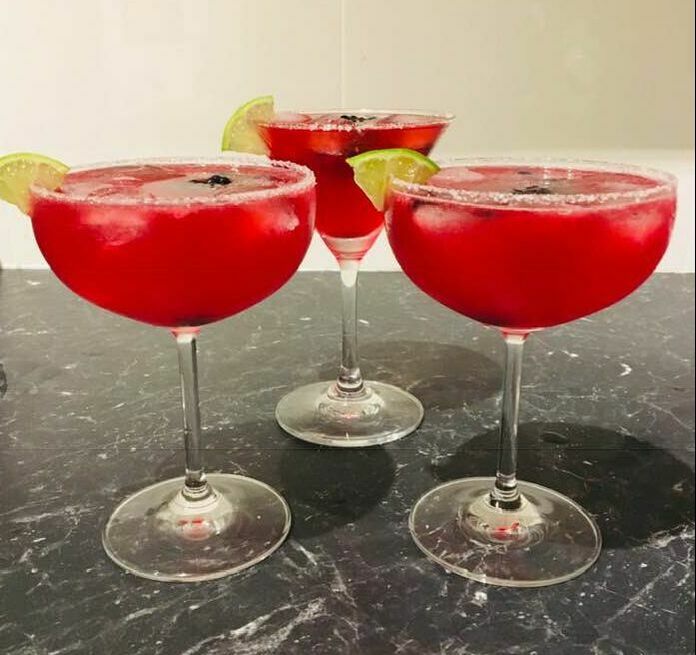 Triple Berry Margarita: I do love a Margarita and this triple berry version is beautiful and delicious. So there you have it, a few ideas to serve for Easter or any party for that matter. ​So off I went with my gorgeous friend Pat to see Manu Feildel cook at Peters of Kensington today. I don't get star struck by celebrities, but a chef, I just love watching someone cook, really is what I enjoy (throw in a small bottle of sparkling wine at 11am, and it is brilliant). Manu was funny, entertaining, quite witty, if you get a chance to watch him cook, he is great. The food, he cooked three dishes for us, Potato and Parsnip Gratin already on my website, the one I posted was from his cookbook which was with potatoes only, if you want to add parsnips just add half potatoes, half parsnips. He also cooked his Pearl Barley Risotto with Wild Mushrooms which happens to be my husband's favourite risotto, and is also already posted on my website. So I was very excited that 2 out of the 3 recipes he made are my families favourites. Then the third dish was this Tian Provencal, now I love eggplant, zucchini, tomato and onions. I love rosemary and thyme, so when he made this I knew it was going to be cooked for dinner that night. First I had to stop and get the ingredients, with a slight detour into wheel and barrow to buy myself a new dish to cook it in. I love homewares stores, I love looking in them, seeing what's new. Anyway ingredients purchased, what to serve with it. As I had spent the morning watching a man cook for me, I thought it fit that when I got home I got my husband to cook for me to, make it the perfect day. So I thought I'll cook the side dish while my husband can barbecue some T-bones steaks for us. Dinner was delicious. The aromas coming from the oven whilst the Tian Provenal was cooking made me know I was going to enjoy it. Teamed with barbecue T-bone, dinner was amazing. The amount of vegetables will depend on the size of your baking dish, mine was a base measurement of 28cm x 20cm rectangle, but as it is so simple you can add extra vegetables and make it bigger, or reduce the amount of vegetables to make a smaller portion. Manu's recipe stated 1kg of eggplant, 1kg zucchini, 1kg tomatoes. 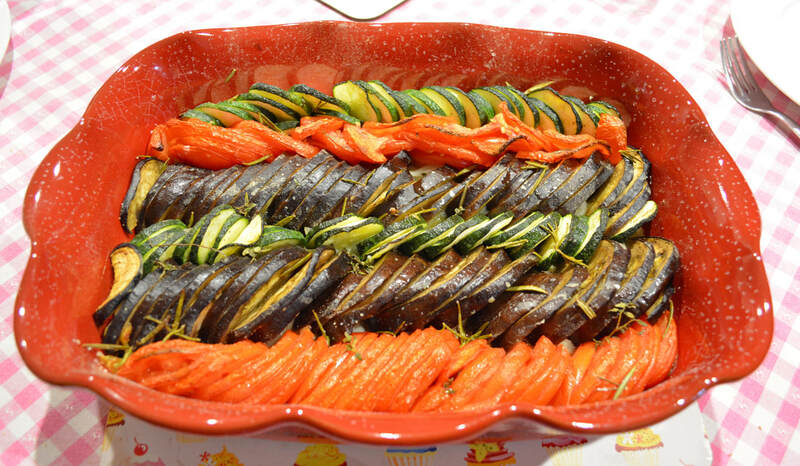 I found that was too much, so just think about your baking dish and think equal quantities of those three vegetables. Now you also want to have your vegetables similar in size, so to match the size of a zucchini, you want to slice the tomatoes and eggplants in half, then slice them. 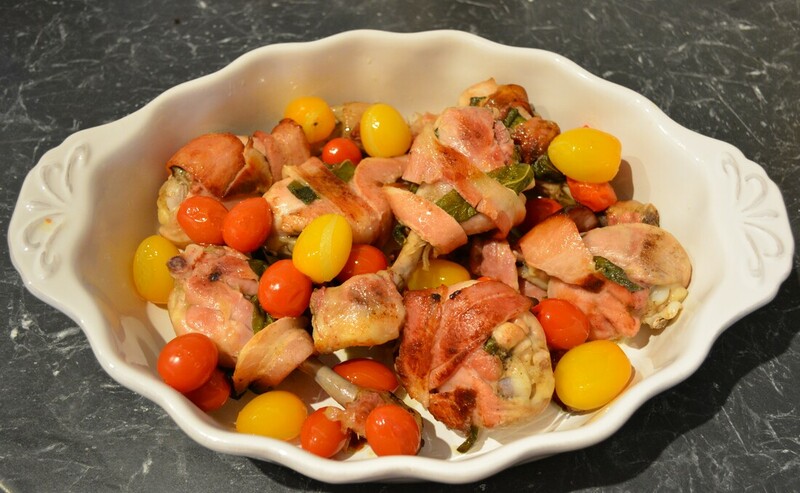 So here is a great barbecue/party dish, as it serves 6-8 people. Simple and yet so tasty. Preheat oven to 220C/200 fan forced. You want your vegetables similar in size, so match your tomatoes and eggplant to your zucchini. Eggplant, cut in half lengthways (from stem to top), then slice in to 1/2-1 cm thick slices. Tomatoes, cut in half lengthways (from stem to top, if the tomato is large), then slice in to 1/2-1 cm thick slices. Zucchini slice in to 1/2-1 cm thick slices. Drizzle some extra virgin olive oil into a frying pan over medium heat, add the onions, sauté the onions until lightly golden. Add the garlic and sauté a further 2 minutes, season with some salt and pepper. Drizzle some more extra virgin olive oil into the base of your baking dish, spread your onion and garlic evenly over the base. Now vertically layer the tomatoes in one row, then the eggplant, zucchini, eggplant, tomato then zucchini, until you get to the other side of the dish. Drizzle a good amount of extra virgin olive oil over the vegetables. It needs to be a generous amount (approx. 1/2 cup, I really didn't measure) as this will be part of the sauce at the bottom, and will ensure your vegetables won't be dry. Sprinkle over some rosemary and thyme (to taste) and season well with salt and pepper. 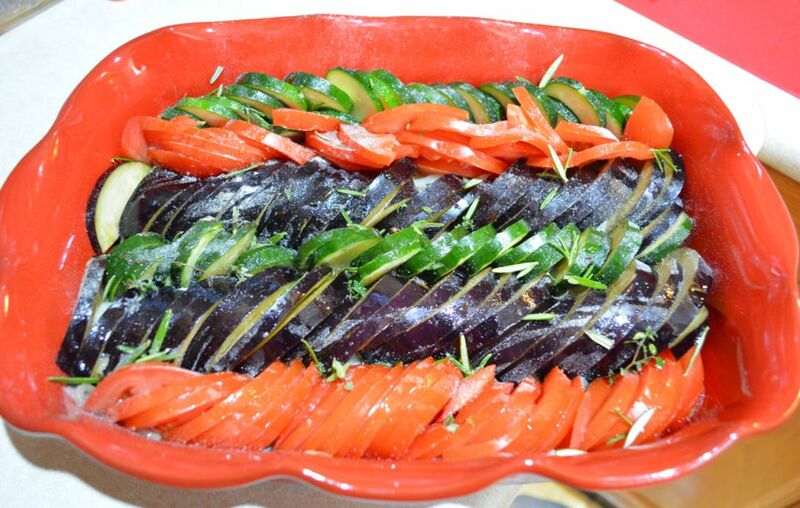 ​Place in the oven and bake uncovered for 45-60 minutes or until the vegetables are just soft. ​Today I am posting a recipe I really don't like, I never have. I am posting it as it is something my mum has made for as long as I can remember, it is something I grew up on. Now I grew up on it, but never liked it, you may wonder why then post it, I'm posting it as my parents love it, my husband loves it and my kids love it. 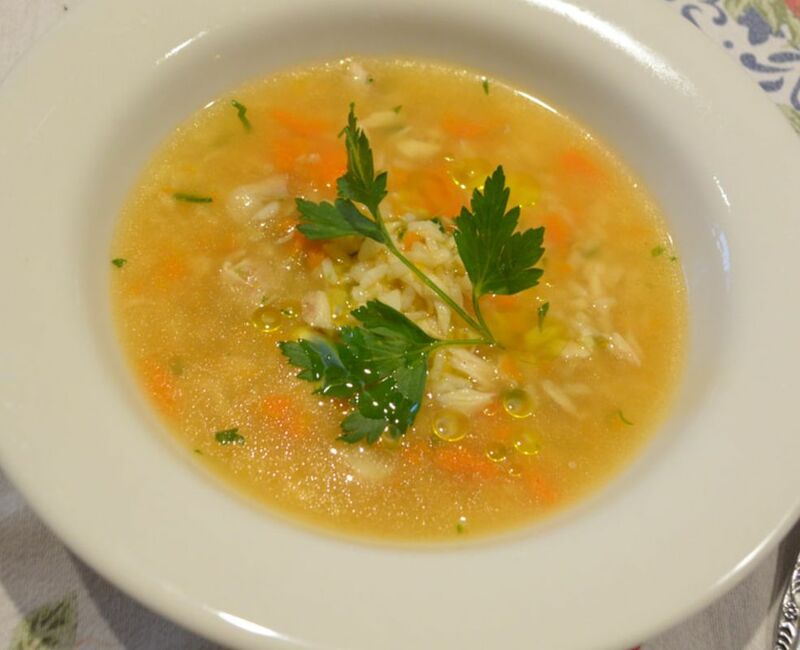 This soup is something my mum taught me, I have been making it myself for 19 years now (since I got married) and it really is something my family loves. Now I have to say I do love the fish that is cooked to make the fish soup, I find it absolutely delicious. This meal is a dieters dream as it is low in fat and so good for you. Now for the fish, I like using whatever my husband catches, but if I bought it, you should try adding a few different varieties of fish instead of just one type of fish. I like red rock cod, red emperor, leatherjacket, long fin perch. 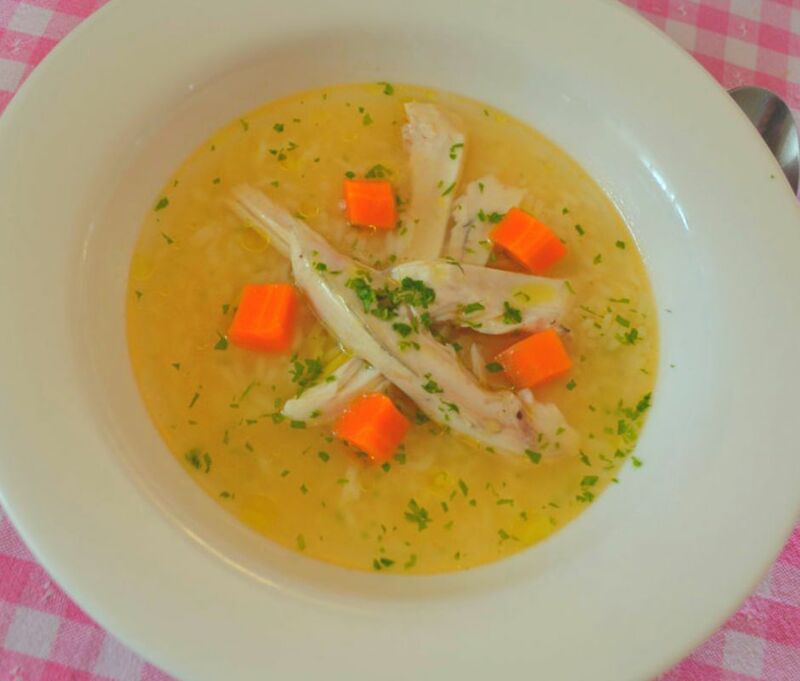 You can even make this soup from fish bones and heads once you have filleted fish for another use. It cooks the same way and you will have a lovely flavoursome soup. This recipe is also what many call a Fish Stock, so if you need to make a fish stock, use this recipe. So if you love fish, try this, it really is good for you, my kids were raised on soups like these, and apart from me, everyone loves it. Place carrots, onion, celery, garlic, tomato, lemon rind, vinegar, oil, salt, pepper, vegeta, parsley and water in a large saucepan. Bring to the boil over high heat, once boiling, reduce heat to low and simmer for 30 minutes. Increase heat to high, add the fish and potato slices, bring to the boil, once boiling, reduce heat to low and simmer for 15-20 minutes. The fish is cooked when you see it has just come off the bone. (If you are using fish bones only, keep them in the soup and cook a further 30 minutes). 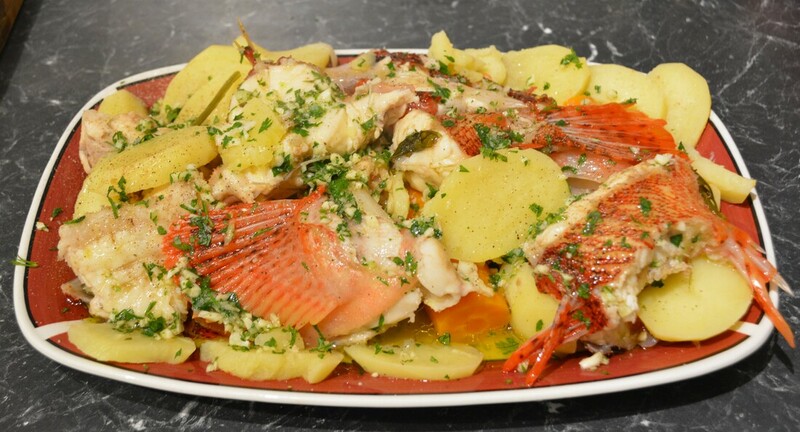 If you are eating the fish, remove the fish, potatoes, 1 carrot from the soup and arrange on a large platter. Sprinkle with the extra parsley and garlic, season with salt and pepper and drizzle with olive oil. I also like to add 1/2 a ladle of soup. 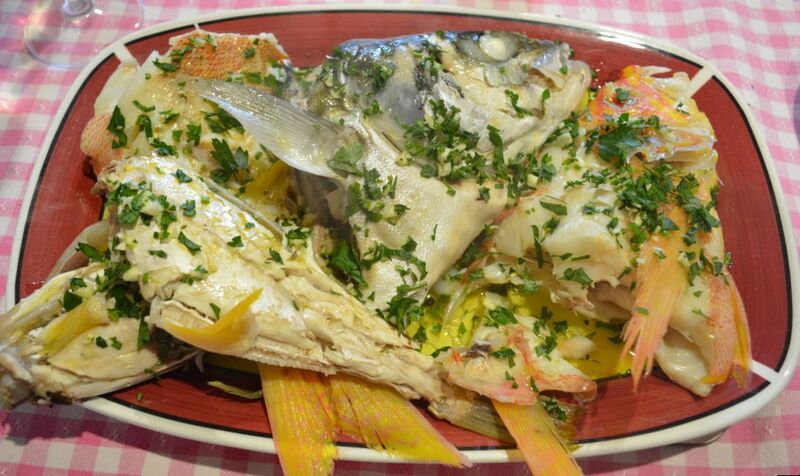 Serve the fish with some crusty Italian bread (dip the bread into the olive oil, garlic infused soup, it is delicious). ​If you don't eat all of the fish, just remove the bones from what is left, and place the fish and any oil infused soup left on the platter into a bowl, you can add it to the soup in the last 5 minutes of cooking once the rice has been added. Now back to the soup. Once cooked, strain through a fine sieve into another saucepan, you want a clear broth. Bring the soup back to the boil. Wash the rice through a fine sieve until the water runs clear. Add the rice to the soup, simmer gently, stirring occasionally, until the rice is cooked, it takes about 12 minutes. In the final 5 minutes of the rice cooking time, if you have leftover fish to add, do it then. 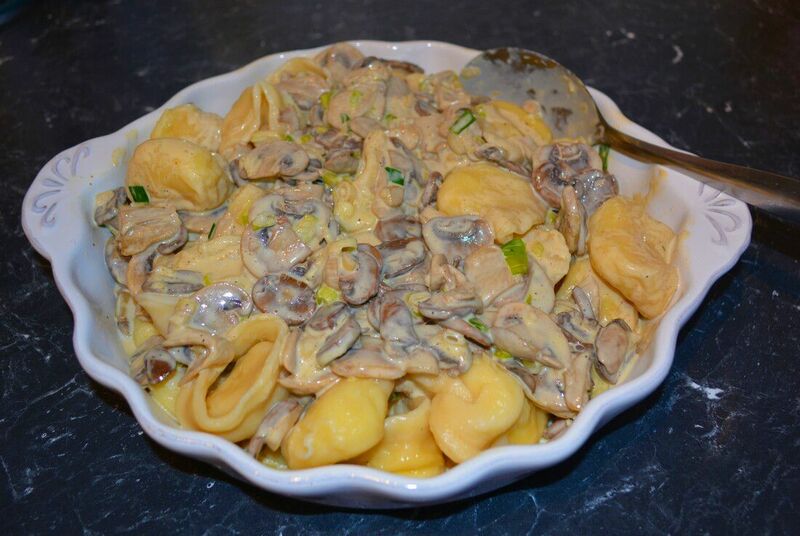 Serve immediately, sprinkled with extra parsley, if you like. 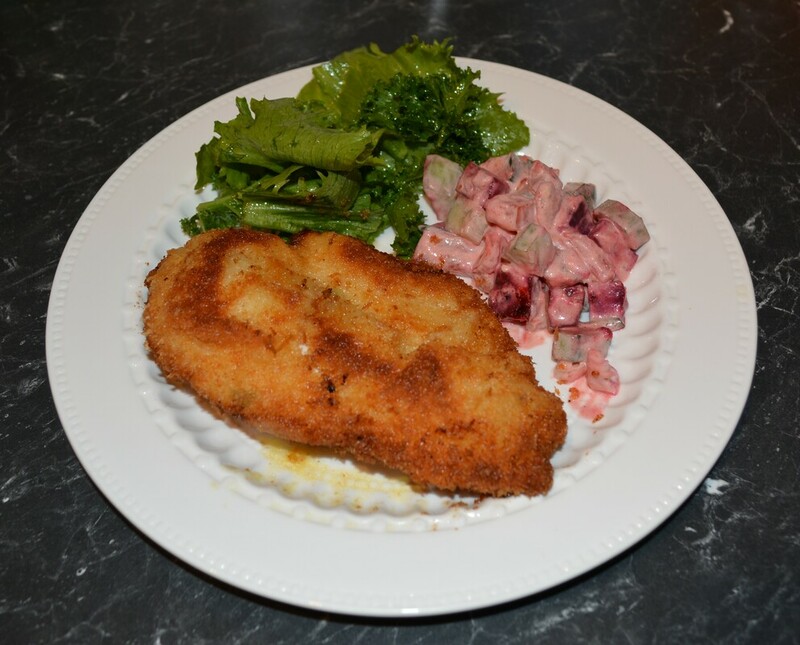 ​Here is a recipe that I had heard about for a really long time, I mean who hasn't heard of chicken kiev. Well I finally got around to making it when our Eating Around the World Adventure took us to Ukraine. ​I love homemade lemonades, they always taste so fresh. 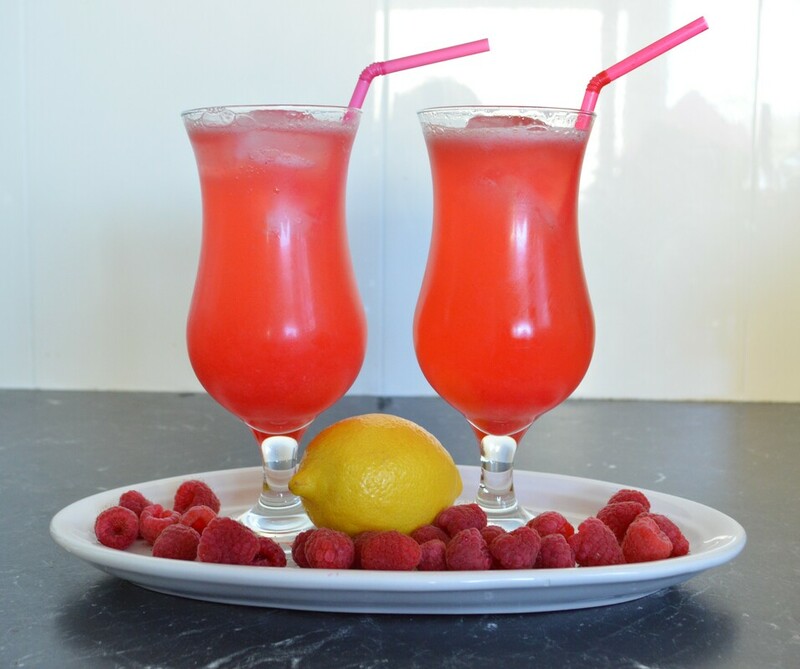 This raspberry version is delicious, it looks beautiful and more importantly is so easy to make. The sugar content is up to you, it really depends on how sour your raspberry and lemons are. 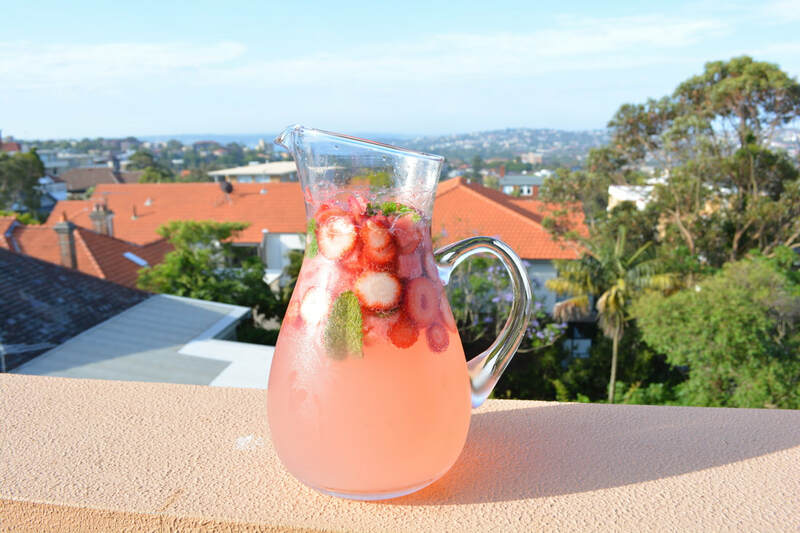 But how I fix it, if I feel it is too sweet, just add more water, or I add a glassful of ice, then top up with strawberry lemonade and allow the ice to not only chill your drink, but also dilute it also. So add more or less sugar, that is really up to you and how you like it. It makes about 6 glasses, so when I have guests over I would make it in a large jug. 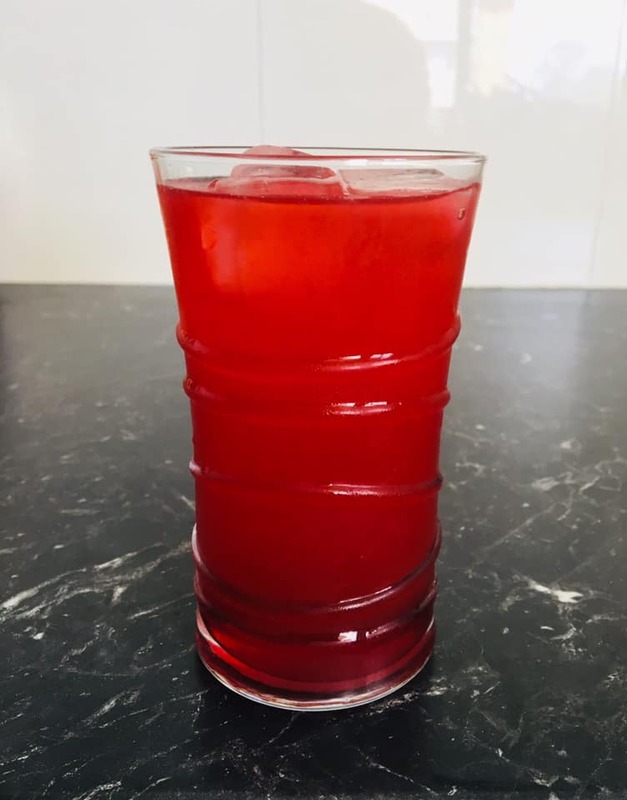 But if I'm just making it for my kids, what I do rather than make a large jug of it, I pour the mixture without the water into a bottle and my kids make it when they are thirsty and use it like you would cordial, and add water when needed. 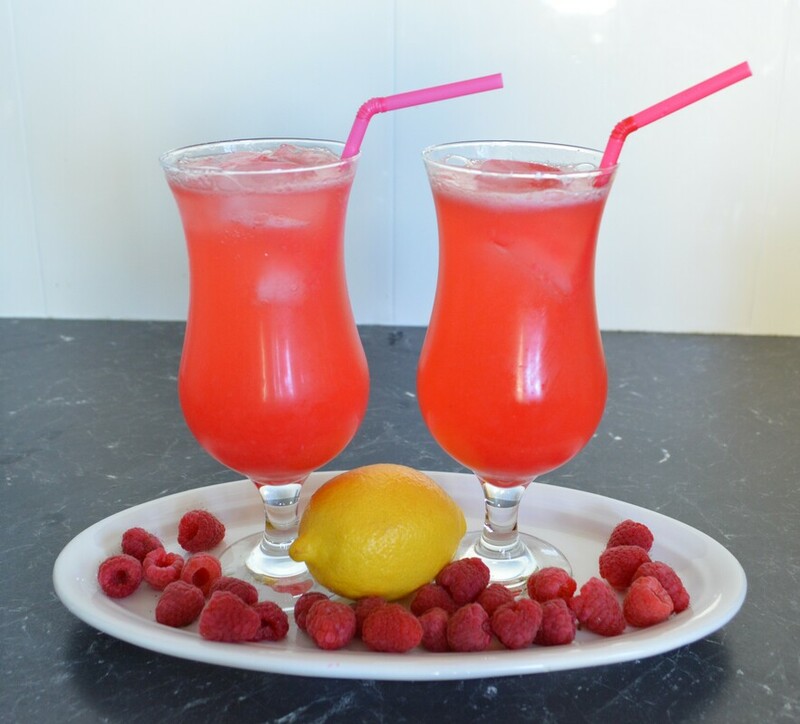 I also have recipes for traditional lemonade and a strawberry lemonade. Both delicious. 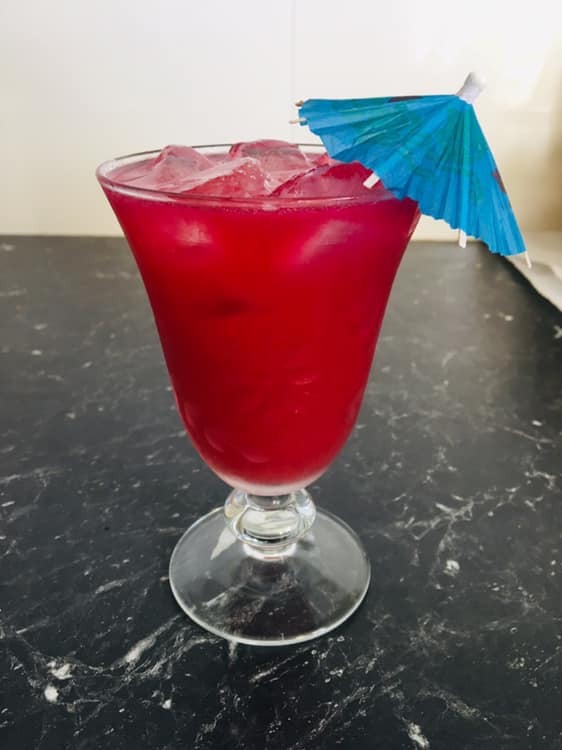 This is a drink that would look good served up at a party, looks beautiful, tastes even better. Give it a try. Combine the raspberries and sugar in a blender and blend until smooth. Place a fine sieve over a large bowl and push the mixture through to remove the seeds. Discard the seeds. Pour into a large jug and stir in the cold water. Refrigerate until cold. To serve, pour over ice cubes and garnish with mint leaves.